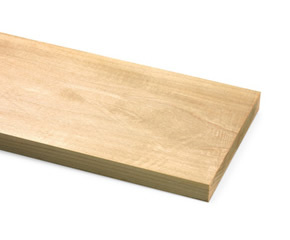 This is a very light-colored medium-to-hard wood, abundant in the eastern United States. Known for its shock resistance, maple has diffused, evenly-sized pores that give the wood a fine texture and an even grain. Eastern maples are generally harder than western maples, due to the colder winters and shorter growing seasons. Both are highly durable and take any stain well. Maple can be finished to resemble walnut, cherry, or other more expensive hardwoods.